‘Pipes and Cisterns’ is also a favourite math chapter of all competitive exams. So, we should also give same effort like others chapters, we had given before.We should earn the ability to solve in shortcut method to save our time in the competitive examination hall. Here we will discuss the Pipes and Cistern math tricks for the shortcut purpose. Before discussing Pipe and Cistern math tricks, we want to inform you that this chapter is co-related with Time and Works math tricks. So now, just we have to update with some extra shortcut formula. Before going to the shortcut method, I want to inform you that the pipes are two types. A pipe which fills tank or chamber is known as inlet pipe, and another pipe which empties the tank or chamber is called outlet pipe. 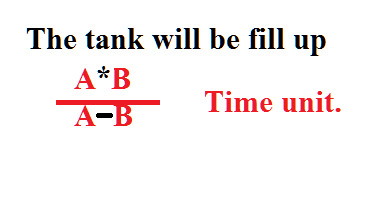 When two pipes are connected to a tank, and it can fill the tank P and Q hour respectively. If both pipes are open and started filling the tank at the same time, then these pipes will take to fill the tank. Please note, here A and B are the time unit which needs to fill the tank with two pipes. 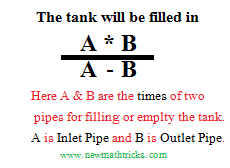 The above formula can also be used while both pipes are the outlet and empty a full tank. One More thing you should know if you get the result as fractional after calculating, then you should convert into the minute or hour as per requirement of the question. The fractional hour will be converted into minute by multiplying 60. And fractional minute will be transformed into the hour by multiplying 1/60. The fractional day will be turned into the hour by multiplying 24. 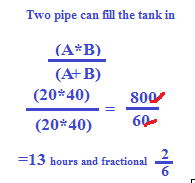 Two pipes can fill a tank in 20 and 40 hours respectively if both pipes open at the same time then how long they will take to fill the tank? = 13hour and 20 minutes. Here inlet should be full up the tank faster than the outlet pipe empties the tank. An inlet pipe can be filled up a tank in 20 hours, and outlet pipe can empty the tank in 40 hours. When both pipes are opened then how long time they will take to fill up the tank? Here the value of inlet pipe A is 20 hours and outlet pipe B's value is 40 hours. Here we directly use the above shortcuts formula. 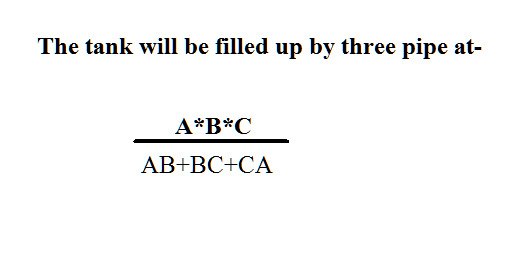 Also, this formula can be used when three pipes are outlet pipes and empties a full tank. 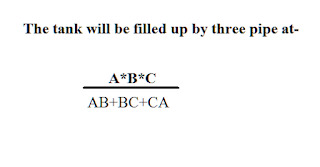 The above formula and sample question was straightforward and easy. But you need more advance Pipe and Cisterns shortcuts method and mathematics practices for the score well in your upcoming competitive examination. So we have created more pages from a simple problem to advance math problem. Carefully read and practice with copy pen for your better understanding and observe as well.